Hello, Welcome to Goomba's Pizzaria & Trattoria! The Merlino familia wants to bring you excellent quality, fresh ingredients, and, most importantly, customer satisfaction. We are from Philadelphia with over 35 years' experience in the food industry. As you will come to see, we do not cut any corners when it comes to quality and to bringing you a touch of our Philly Italian heritage. Most of our menu is homemade on site daily. Homemade pasta, meatballs, 100% lump crabcakes, half-pound burgers, BBQ & Wing sauces, Caesar dressing and, of course, our red sauce (what we call 'gravy'). Our hoagies and hot roast pork sandwiches are unlike any other sandwich you will ever have. They are each an experience in itself. 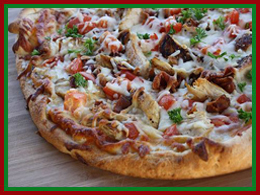 Our pizza's are all hand-tossed, made with nothing other than fresh ingredients. We have so much to offer anyone who truly appreciates Italian-style cooking. Our greatest goal is to make you our friend and customer, by serving you delicious food and providing excellent service. So, thank you for visiting our site! Now open up the menu and Mangia!